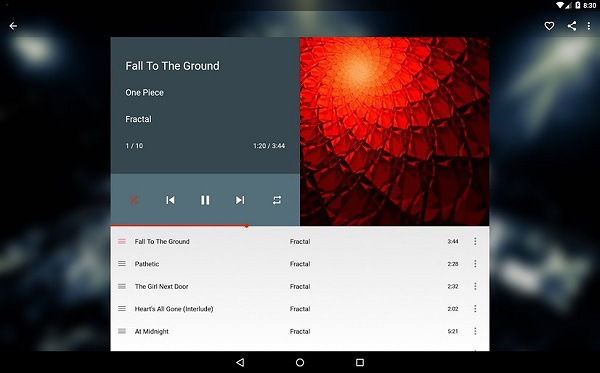 This article here in shall point out 5+ best music player apps for Android that you should experience and then chose one of them as your favorites. Some of them below are paid apps, but all of them are worth using. Let’s discover! 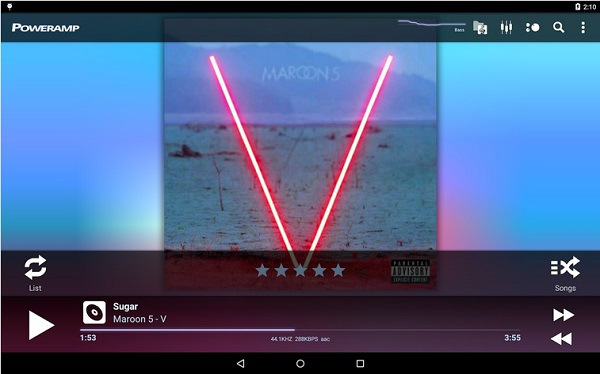 N7player is considered by many Android users as one of the best and strongest music players that you should have on your Android devices. The most distinguishing feature of this app is that the difference of its user-interface. Speaking of its appearance, we have to admit that a simple scrapbook kind of look makes us more interested in. Its tag cloud format is another plus point, which accompanies with various names of the artist and their song. 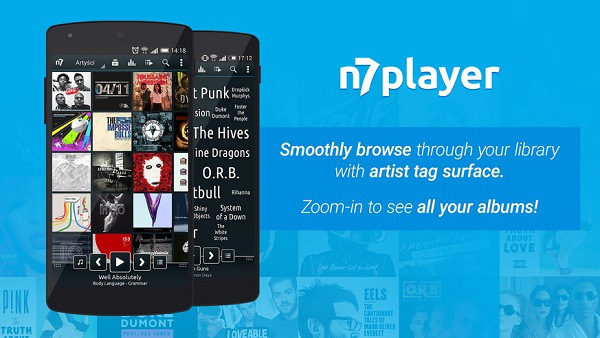 Many users have experienced that N7player will play songs without any interruption. Anything else you would find on this app? Let’s try it and devote you on romantic music songs with N7player. When it comes to Google and its apps, we should not forget “Google Play Music” which is provided free via Google play store. 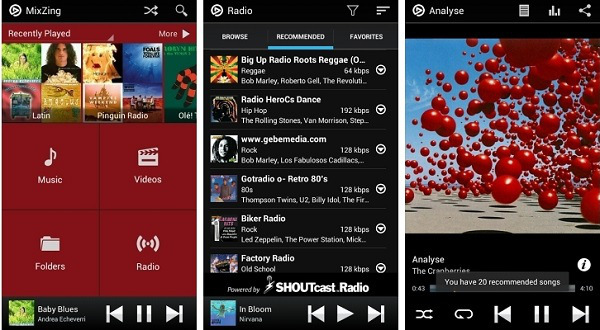 Also, it is considered as the best free music player apps for Android. 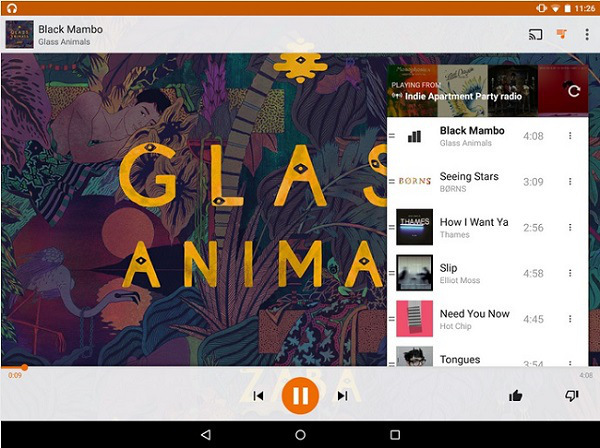 One of the noticeable features of this app we should mention is that the capacity of Google Play Music, which allows to add up to 50,000 music files. You also can free-to-chose the way to make your collection on this app. 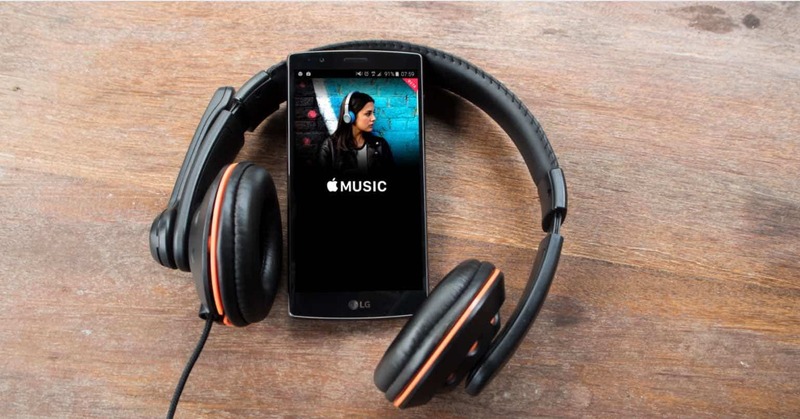 Because of its connection with Google, users can download music song from the Web directly to our offline collection, as well as purchase any song from Google play store. Another prominent feature is that users can make their own radio from their collection to enjoy anytime in their unique way. It is counted on Google play store that around 60 million users have installed this app. 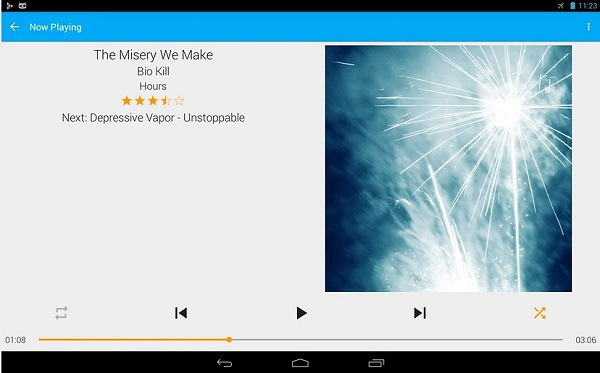 We should name “Poweramp” on our lists of best android music player. You can install this app from Google play store with no free, but it just provides you with 15 days trial, then you must pay the fee to use full of its functions with the button inside the player. Like other kinds of music player currently, the PowrAmp has supported branches of sound formats such as Mp3, Mp4, Wav, etc. Poweramp also supports your headset option with automatic resume for headset, Bluetooth connection, and many other special features. One strong rival of other music players above is Mp3 Player. Although its name is Mp3 Player, it also supports other types of extensions such as Wav, Ogg and so on. Its appearance with attractive and impressive interface make users more excited. Also, it is easy to use with easy control. In this app, we can create our own favorite lists with the song of our chose, with add and remove function built inside. The most outstanding feature we want to point out, although for last but it always lights out, is that Mp3 cutter function. Not many apps allow us to do this. 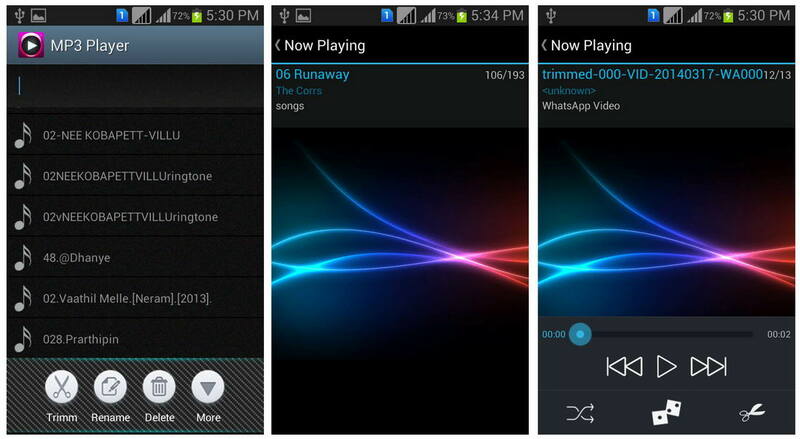 With Mp3 Player, we can shorten down the duration of the song for making ringtones for example. 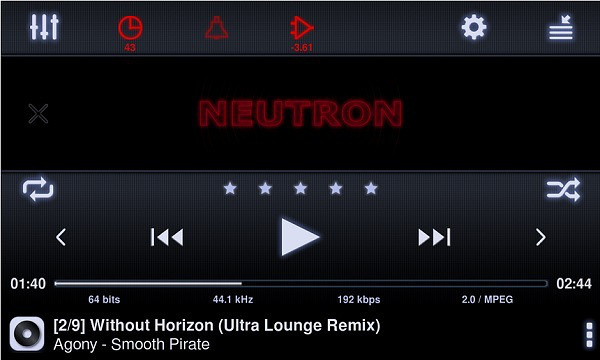 Not much more band equalizer than N7player, but it is enough for us to experience an excellent app for listening music. Shuttle, it is known as the most lightweight music player for Android users that provide you with both free and a paid version of Shuttle. With the free version, you can access on basis functions and is supported by all audio formats. Full of features for this paid version such as automatic downloading process, playback without gap and space. Besides, its appearance is friendly accompanied with tons of theme options for your preference. Sleep timers inbuilt allows you to control the way you listen and the time it is shut down. With a paid version around $5 and trial version for maximum 10 days, you will experience one of the best music player apps. Although you have to pay for use full of features, it is always a worthy investment, because we will discover much more functions built-in in this apps. First and foremost, it supports numbers of sound effects which you can choose from the list and change the way you listen anytime. All kind of audio format is supported in Neutron. One another a paid music player in this list is GoneMAD – impressive name that shows you a flexible and changeable user interface themes. You are allowed to access a free trial version for at least 14 days. Its standard features and option make this app stand out than others. 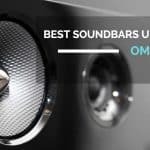 It supports all audio formats such as Flac files, Ogg, mp3,… Several features are gapless playback, crossfading, bass boost and especially a 10 band equalizer. If you often listen to music and watch its lyrics at the same time, this app – Musixmatch will be a great choice for you. 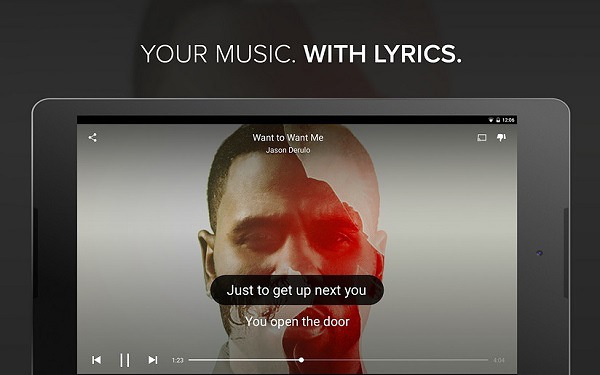 Beyond its function as a music player, the users can show the lyrics synced with the music tracks you play that is the most prominent feature of this app. 5 band equalizer is enough for us to experience great music. Its appearance is stand out with friendly and professionally look. The special point here is that you can use the free version with all features inbuilt. It is named lastly, but it is one of the powerful music players for Android until now. MixZing stands out itself with numbers of features and options accompanied with proper music playback performance. Also, this app consumes battery not much than other apps above. Homescreen widgets and a sleep timer option would be another distinguishing feature that should be exploited. With timer option, it will automatically shutdown regarding the duration of your choice. Android also is suitable for MixZing install in. MixZing provides users with a free cost version that you can download directly from Google Play Store..